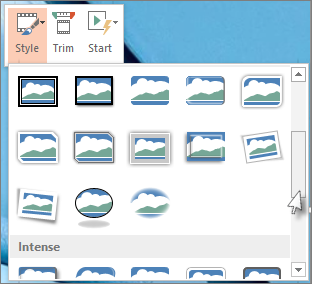 You can record your computer screen and related audio, and then embed it in your PowerPoint slide—or you can save it as a separate file. To record and listen to audio associated with your screen recording, you'll need a sound card, microphone, and speakers. Make sure there's enough disk space on your local drive to record and save your screen recording. Open the slide that you want to put the screen recording on. On the Insert tab of the ribbon, select Screen Recording. On the Control Dock, click Select Area (Windows logo key+Shift+A), or, if you want to select the entire screen for recording, press Windows logo key+Shift+F. The minimum size area you can record is 64x64 pixels. Tip: PowerPoint automatically records the audio and the mouse pointer, so by default those options are selected on the control dock. To turn them off, deselect Audio (Windows logo key+Shift+U) and Record Pointer (Windows logo key+Shift+O). Click Record (Windows logo key+Shift+R). Tip: Unless you pin the Control Dock to the screen, it will slide up into the margin while you record. To make the unpinned Control Dock reappear, point the mouse cursor at the top of the screen. Click Pause to temporarily stop the recording (Windows logo key+Shift+R). Click Record to resume recording (Windows logo key+Shift+R). Click Stop to end your recording (Windows logo key+Shift+Q) (shown below). When you are finished recording, save your presentation: File > Save. The recording is now embedded on the slide you selected in step 2. To save the recording itself as a separate file on your computer, right-click the picture on the slide that represents the recording, and select Save Media as. In the Save Media As dialog box, specify a file name and folder location, then click Save. Important: To use the screen recording feature in PowerPoint 2013, install the February 16, 2015 update for PowerPoint 2013. On the Insert tab, click Screen Recording. On the Control Dock, click Select Area (Windows logo key+Shift+A). A cross-haired cursor appears. Click and drag to select the area of the screen you want to record. If you have already done a screen recording during your current PowerPoint session, your prior area selection will appear on the screen. You can proceed with recording if that selection area suits you, or you can click Select Area to start over. When you are finished recording, save your presentation: File > Save. The recording is now embedded on the slide you selected in step 1. Install version 15.0.4641.1001 or later for the Click-to-run version. Install both of these updates (KB2883051 and KB2883052) for all versions except Click-to-run. Right-click the video frame, and click Save Media as. Tip: Ensure your disk has enough space to save the video file. Otherwise, you'll have to free up space and try again. In the Save Media as box, choose a folder, and in the File name box, type a name. Right-click the video frame, click Start, and pick how you want your video to start in your presentation; automatically when a slide appears, or when you click the mouse. 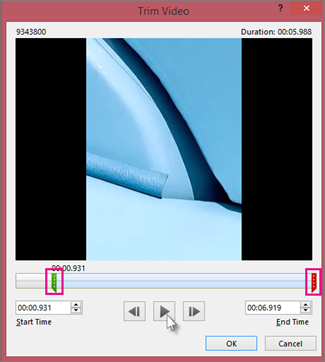 Right-click the video frame, and click Trim. To determine where you want to trim your video footage, in the Trim Video box, click Play. Tip: Use the Next Frame and Previous Frame buttons to specify precise timing. To trim the beginning of the clip, click the start point (shown in the image below as a green marker). When you see the two-headed arrow, drag the arrow to the desired starting position for the video. To trim the end of the clip, click the end point (shown in the image above as a red marker). When you see the two-headed arrow, drag the arrow to the desired ending position for the video. Right-click the video frame, click Style, and pick a style you like.